added to the search results page using different mechanisms. different process independently decided if news results should be added. 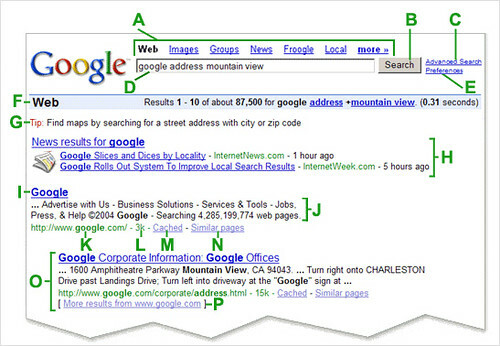 measured directly against other types of search results, such as images or news. to the page. That’s the comparative ranking part. wherever, rather than always being put at the top. vertical search listings. That can still happen, but it’s also the case that blending can mean adding vertical results to the web search results, without taking some of the web search listings away. web search results, local results were fourth in overall relevancy. next to the local box counted as results 4 through 6. After the box, there were four more listings — 10 in all. The local listings caused three of the web search listings to get removed. shown in addition to the main list rather than displacing results from it. as will be seen further below. Blended Means Top, Bottom & In Between! 10 web listings, taking the place of one of them. bottom. But top display pretty much seems standard. In addition, image search always seems to be additive — i.e., you get image search results, plus 10 other results — 11 listings, in all (or 13 listings, if you count each image shown as a separate listing). Universal Search, and the others are all places I’d have expected it to kick in. Search blending in California just as I did when I was searching from the UK. the best way for us to ensure a certain quality of experience for users. Video now encompasses hundreds of sources for video content, Google said. results page through Universal Search, Google can seem very fresh. and insertion into the index. services like news or blog search, as well as Googlebot for the general crawl. Google’s index to be sliced and diced as appropriate. did the search — and it was probably showing up well before that. mistakenly assumed that the entire Google index is refreshed within minutes. So far, I’ve shown examples of one type of vertical result being blended. search result as a separate listing. there are news archive results. Where Have All The OneBoxes Gone? Google’s search technology finds many sources of specialized information. local websites related to your search. multiple content types, including images, news, books, maps, and videos. So, are OneBoxes gone? Are these things part of Universal Search too? according to decisions made by other search algorithms. Who Cares How It’s Blended? blend and where to order it. relevant, they don’t care how it is done. on how smart Universal Search is in terms of comparative ranking. don’t see what Google is doing as that unique.